Signing Masahiro Tanaka will be an expensive endeavor. Tanaka, who officially has been posted by the Rakuten Golden Eagles of Japan’s Nippon Professional Baseball, is expected to cost a minimum of $17 million per year, according to USA Today’s Bob Nightengale. The 30-day posting period for Tanaka began Thursday. Any major-league team can negotiate a contract with Tanaka as long as it’s willing to pay the Eagles a $20 million fee on top of whatever it agrees to pay the Japanese pitcher. It’s been speculated that Tanaka could earn a contract in excess of $100 million, and that possibility seems even greater if the starting price in negotiations indeed is $17 million annually. 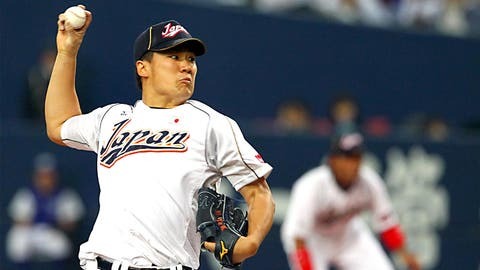 Tanaka went 24-0 with a 1.27 ERA with Rakuten in 2013. He is still just 25 years old and is viewed by many as a potential ace. The Yankees already have contacted Tanaka’s agent, Casey Close, according to Newsday’s Marc Carig. Close also represents Derek Jeter and Mark Teixeira.